The template you choose when you start your website comes with some sample pages—usually Home, About, and Contact. Chances are, this probably won't match the structure you have in mind for your own website. By editing your navigation, you can easily add, move, copy, and delete pages as you like. Before you start, it's a good idea to review the different kinds of navigation menus so you know which one you're using on your website. In Edit Mode, hover your mouse over your website navigation. You'll see a blue box pop up that says Edit Navigation. Once you click Edit Navigation, a gray box will appear with all your menu items in it. 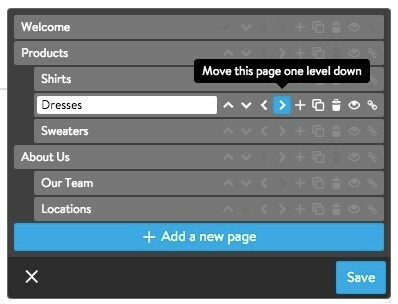 From here, use the icons next to each menu item to move, add, copy, delete, or hide pages on your website. Click the plus sign (+) icon to the right of one of the existing menu items. This will add a new page below that menu item. Type in the name of your new page. Alternatively, you can add a new page to the bottom of your navigation by clicking the blue + Add a new pagebutton. Once you've added a page, it will appear in your website navigation menu. Click on the link to go to that page, and then start adding your content. When you add a new page, you can choose if you’d like to use one of our awesome Suggested Layouts. 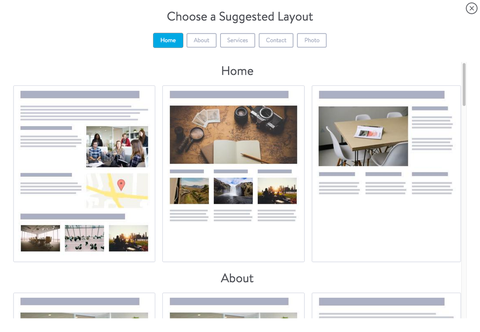 Suggested Layouts are pre-designed pages that you can fill in with your own content. They are designed for Home, About, Services, Contact and Photo Gallery pages, but you can use them for any type of page you want. If you don't want one of these layouts, simply close the box and start adding your own elements to the page. If you select a suggested layout, you’ll see a preview with placeholder content to give you a better idea of what it looks like on your website. To try it out, select to Use It. If you don't like it, select Undo. If you're working on a page and decide you'd like to use a Suggested Layout instead, just delete all the elements on the page. Then, the Suggested Layout menu will pop up again. A Suggested Layout is just that—a suggestion. You can still move, delete, or add elements to these layouts at any point. Plus, you'll want to edit each element to replace the placeholder content with your own information. Click the overlapping squares icon next to the page you wish to copy. Change the name of the copied page. Click the trash can icon next to the page you wish to remove. Confirm your decision by clicking Yes, delete! Remember that deleting a page is permanent! Once you confirm, that page (and all the elements on it) will be deleted. Sometimes it's necessary to hide pages that you don't want to show up in the navigation. You can still directly link to these pages (and they are still public if someone has the direct URL), but they won't show up in the navigation menu. For example, you may want to hide a page while you're working on it. Or, let's say you're a photographer and you want to create a page with photos specifically for one client. You can hide the page from the navigation and send your client a direct link to that page. Other people browsing your site won't see it. Click the eyeball icon next to the page you wish to hide. To unhide it, simply click on the eyeball icon again. Once you hide a page, you'll still be able to see it when you're in Edit Mode—it will appear crossed out in your navigation. (Don't worry, this is visible only to you.) You can click on a hidden page and edit it just like a normal page. When you're in Edit Mode, hidden pages will appear crossed out in your navigation menu. Instead of linking to another page on your site, you may want part of your navigation to link to a different website entirely. For example you might have a menu item in your navigation that says "Review Us" with a link to your Yelp profile. Click the link icon next to the menu item you want to link from. Enter the URL of the external website in the URL field. You can move pages either to change the order of the links in the navigation or to create a subpage (a page nested beneath another page). 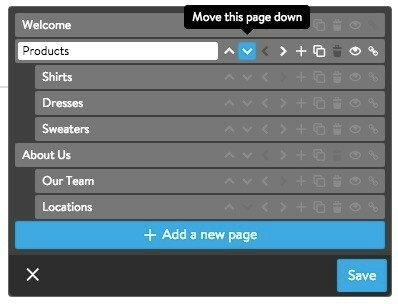 Click the up or down arrows (or use the arrows on your keyboard) to change the order of pages in your navigation. Click the right arrow to make a page into a subpage of the page above it. Click the left arrow to move a subpage up one level in the navigation. 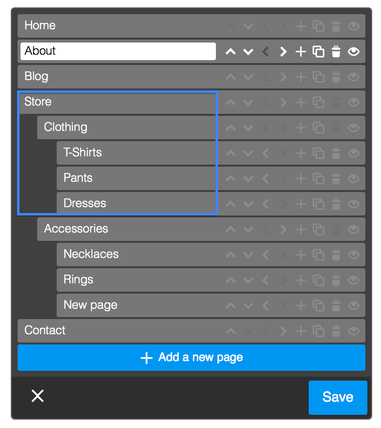 A subpage is any page of your site that is not part of the main navigation. For instance, your main navigation may contain links to pages called Home, About, Contact, and Store. Each of those pages can contain subpages —these pages are only visible in dropdown menus or when someone visits the navigation page that they are nestled under. Jimdo has 3 levels of navigation, which means you could have a page called "Store," a subpage of "Store" called "Clothing," and a subpage of "Clothing" called "T-shirts." Open the Menu and click on Settings > Website > Password-Protected Areas. Click Add new password protected area. Type in a name for the new Password-Protected Area. 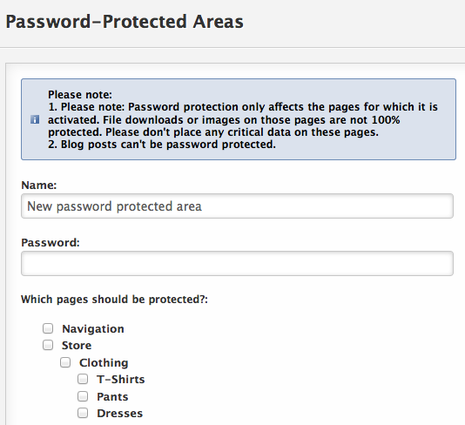 Check the box next to each page that you want to protect with this password. Free users can create one password-protected area. Pro customers can create five password-protected areas. Business customers can create as many password-protected areas as they'd like. Password protection works only for individual pages, and not for entire websites or Blog articles. File Download Elements or images on the pages are not 100% securely protected. We strongly advise that sensitive content is best kept off your website. The content that you choose to place on your website and the security for this is your responsibility.